#MoviesMusicPlaysFilmFestivalsConcerts: Film Review: "The Imitation Game"
There's not a single memorable scene in "The Imitation Game" and no scene stands out over the others because every scene in the movie is as memorable as the other. 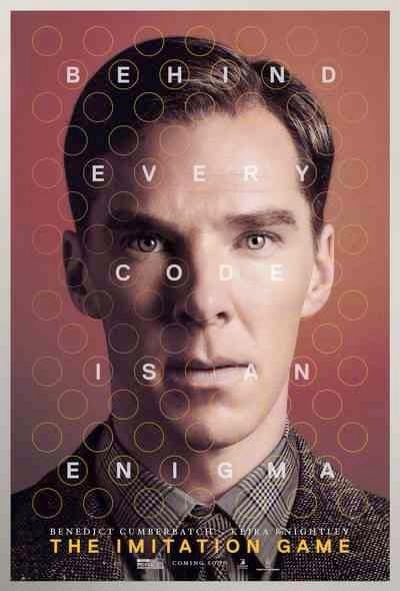 Each scene is beautifully composed and filled with wonderful performances from a uniformly marvelous cast and a stupendous, career-defining turn by Benedict Cumberbatch who may just, quite possibly, snag the Best Actor Oscar for his quiet and tortured performance as Alan Turing, a closeted homosexual who, with the help of a team he assembled, successfully cracked Enigma, the NAZI communication device that proved to be impenetrable and allowed Hitler to conquer much of Europe until Alan Turing defeated him, that is. The movie is an imposing document of one man's undeclared greatness and enormous sacrifice to save millions of lives in exchange of his own. What an incredible film! What a triumphant performance by Mr. Cumberbatch. I always say that a good movie is one that moves me to tears. This one did. I wrote a quick review for my Facebook friends immediately after the movie ended. I stood up in a corner of the cinema, typed my rave review until i noticed that tears were still flowing through my cheeks, washing the sense of loss i felt for Mr. Turning. Those were tears for his brilliant but short and uncelebrated life; for the pain he carried in his heart because society wouldn't allow him to express who he was, because society decided that he was only good for what he can provide; and for his role in the rise of computer technology and for not benefiting from it. I am raving about the movie not solely because the story is exceptional. I am raving because the quality of the movie-making is just as exceptional. The narrative jumps between three important periods in Mr. Turing's remarkable life: his years in school, his years in the service and his terribly sad final years --- when the world was celebrating the rewards of peace brought on by the end of World War 2 and Mr. Turing was quietly suffering inside, devoid of peace because the world didn't know who he was and those who knew and had power to grant him some piece of happiness wouldn't give it to him. Mr. Turing was recognized for his greatness decades after he died. It may have been late, but as this movie shows, it is never too late to celebrate his life. His story is sad but it is ultimately inspiring. "The Imitation Game" is one of the very best films of the year. You should watch it!